Sushi is one of the foods that may be included in anyone's diet especially if you are considering eating healthy. This is because generally speaking, most sushi is low in saturated fat and high in protein (with the exception of a few). 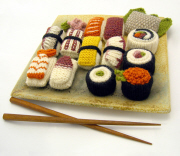 Sushi is often made using raw food, seafood, vegetables, rice and some condiments. Due to this, sushi qualifies to be a part of a raw food diet. The components that we have just mentioned are targeted towards the good health of your heart as well as being nutrient rich. One of these common components is seafood. Fish is one of the excellent sources of protein. Fish oil also promotes the good health of your brain as well as a healthy cardiovascular system. Another good thing about fish is that it supplies the body with quite a number of minerals which include Selenium, Calcium, Potassium, Iron, Phosphorus, Iodine and Magnesium. Seaweed is one of the other components found in sushi. Seaweed has many health benefits. Actually it is said to be one of the healthiest things you could eat. For one, it is rich in minerals, vitamins and enzymes. Because of this, it is excellent for the nervous, digestive and endocrine systems. Overall, the kind of rice used in making sushi will cause it's nutrition facts to vary. The best to use especially when you want to eat healthy is brown rice. It's rich in minerals, fiber and vitamins, B-complex vitamins in particular. Usually sushi is served with soy sauce, ginger and wasabi. The latter two are natural stimulants. They have great benefits for the digestive system and improving overall health. Soy sauce may or should be used sparingly as it increases the sodium content in sushi. We will now take a look at the different types of sushi nutrition facts. The percentage daily values (DV) are based on a 2,000 calorie diet. Your values may therefore be higher or lower depending on your daily calorie needs. When considering the dragon roll and its nutrition facts we realize that it is a good source of Dietary Fiber and Protein. Fiber amongst other things helps with digestion whilst protein helps with the formation of muscle tissue. 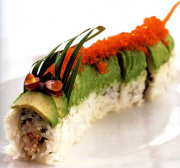 However, the dragon roll sushi is moderate to high in its cholesterol, saturated fat and total fat content. The eel roll sushi nutrition facts show that it is a source of Dietary Fiber and Carbohydrates. It is also a good source of Protein. It is moderate in terms of calories, total fat, saturated fat and sodium. Spider roll sushi nutrition facts reveal that it does not contain much else except for fat. They provide you with 18% of your daily recommended value of fat. This will be considered to be moderate to high. Seeing as the spider roll sushi does not have much nutrition, you may have it once in a while, if at all. Nutrition facts on the shrimp tempura sushi roll show that it of good nutritional value. It is a source Carbohydrates and Calcium, a good source of Dietary Fiber and a very good source Protein and Vitamin A. In addition to this, the shrimp tempura sushi roll is an excellent source of Iron and Vitamin C providing you with 35% and 60% respectively of your recommended daily value of the mineral and vitamin. You may just want to watch out for the sodium, total fat and cholesterol content. 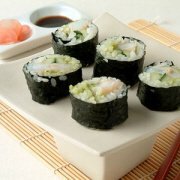 The sushi nutrition facts on the dynamite roll show that it is a source of Iron, Calcium, Vitamin C and Dietary Fiber. It is also a good source of Protein and Vitamin A. This is one of the sushi rolls that are low in total fat and saturated fat. The cholesterol and sodium content is fair. 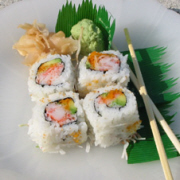 Wegmans California roll sushi nutrition facts show that it is basically a source of protein and dietary fiber, both providing 8% each of your daily recommended value of the nutrients. It does not contain any saturated fat and is low in cholesterol, total fat and sodium. These are all good things of course. It is also low to moderate in terms of the calories. The sushi nutrition facts of the Philadelphia roll show that it is much like the spider roll in that they both do not contain much nutrition. It is basically a source of carbohydrates and does not contain any saturated fat, sodium or cholesterol. It provides just 3% of your recommended daily value of fat, and this is a good thing to have low fat intake. The rainbow sushi roll is a good source of dietary fiber and carbohydrates as well as being an excellent source of Protein. It is however pretty high in calories, especially when compared to the other sushi rolls. The total fat, sodium and cholesterol content is moderate to high. The sushi nutrition facts of the spicy tuna roll reveal that it is a source of carbohydrates, dietary fiber, calcium and iron It is also a good source of Protein, Vitamin A and Vitamin C. Another good thing about the spicy tuna roll is that it is low in cholesterol, saturated fat and total fat. One needs however to watch the sodium content, it is moderate to high. These are nutrition facts for brown rice vegetable sushi rolls. 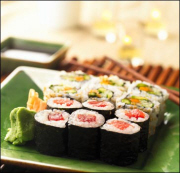 These sushi nutrition facts reveal that they are a source of protein, vitamin C, calcium and iron. 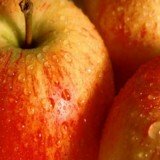 They are also a good source of carbohydrates and dietary fiber. It is cholesterol free and is also low in its sodium, saturated fat and total fat content. Above this, brown rice vegetable sushi rolls are an excellent source of Vitamin A, providing you with 90# of your recommended daily allowance of the vitamin. Vitamin A is essential for the good health of your eyes amongst other things. Nutrition facts of the yellowtail sushi roll provide us with important information. In as far as nutrition is concerned, we can see that it is basically a good source of carbohydrates and a very good source of Protein only. Also the sodium, cholesterol and total fat content are low. 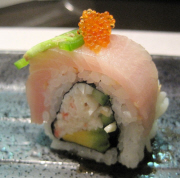 The yellowtail sushi roll does not contain any saturated fat. The sushi maki is also much like the spider roll sushi and philadelphia sushi. They are not of much nutritional value. Sushi nutrition facts on the sushi maki show that it provides you with just 1% of your daily value of Protein and 2% of your daily value for Carbohydrates. It also does not contain any cholesterol, sodium or saturated fat. And has just 1% of total fat. Therefore, if it's sushi you fancy, go for that which is of great nutritional value and is not high in sodium or fat and these may have adverse health effects on one should they be consumed in high amounts.